It's my blog and I'll pun if I want to. Anyway, it’s a few days early, but I’m going to start working out my goals for the New Year. Not quite resolutions, but cycling related things that I’d like to accomplish. 1.) I will massively increase my mileage. Most of this year I’ve done a couple of solo six to twelve mile rides per week, with the occasional twenty-miler thrown in, and one fifty-miler. So an average week has been weighing in at about 24 miles, a good week in the forties and an incredible week in the nineties. For 2012, I’m going to make an average week hit the 60 mile mark. That said, I might try not to spend every mile going flat out the way I currently do. Also, I will find out what those bigger sprockets are for. 2.) I will stop mocking Dave Harmon’s commentary. It’s all good-natured, but I do give Dave more grief than he deserves. Not that he ever reads my tweets. Ok, I’m pretty sure you don’t really pronounce it “Fuh-google-sang”. Nor can I ignore the fact that no other cycling commentator will so consistently look at break that’s got a 35 second advantage with 25K to go, observe that Lampre and HTC are doing the chasing, then sagely announce that he thinks it will stay away to the finish. Death knell pronouncements aside, though, I’ve got to get over my resistance to any commentary team that isn’t Phil and Paul. Besides, he’s got Magnus Backstedt to keep him in check, and he beats Carlton Kirby’s breathless explosions every time a Latvian chancer is first to crest a molehill 100K from the finish. 3.) I will not attempt to carry out every single repair and tune up using a monkey-wrench. Poor, poor Purple Peril. Many of his straight bits are bent due to the overzealous application of a monkey wrench better suited to coercing reluctant mafia debtors than tightening the bolts on a seat tube. 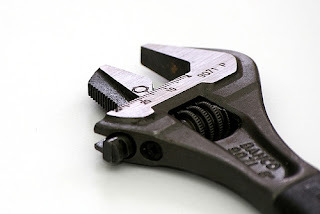 This year, I won’t try to fix the unfixable, and I will use tools appropriate to the job. 4.) I will not train by dead reckoning. I’ve got bad habits: Using low gears make you look feeble. Guinness contains iron and is therefore a food supplement. Twenty minutes riding so hard that I’ve wept blood with each heartbeat means I can spend the next three hours going slowly. This is not science. This year I will work out what I want to accomplish and find out the best way to achieve it. 5.) I will stop making easy predictions. I’ve had a lot of mileage on internet forums this year simply by spotting the sort of short, sharp climbs that suit Joaquim Rodriguez, or the sort of deceptive finishes to lumpy days that suit the tougher breed of sprinters such as Peter Sagan and John Degenkolb. Easy predictions, easy wins. I feel slightly guilty, so this year I’m going to make some riskier predictions - Janez Brajkovic to get a Tour De France podium, for starters. 6.) I will learn to descend. On my terrifying run down Mt Ventoux I noticed that simply glancing across the road was enough to make me sway off course at terrifying speed. I’ve since discovered that this is a well-known phenomenon, usually used as an aid to descending. Keep your eyes on where you want to be when you come out of the corner, they say. If only I'd known that on my downhill run, I wouldn’t have put a year's worth of wear on the brakes of a rented bike. Seriously though, getting better mileage is just a matter of building physical strength, but getting downhill safely is a matter of building a braver brain, and that’s something I need to work on. 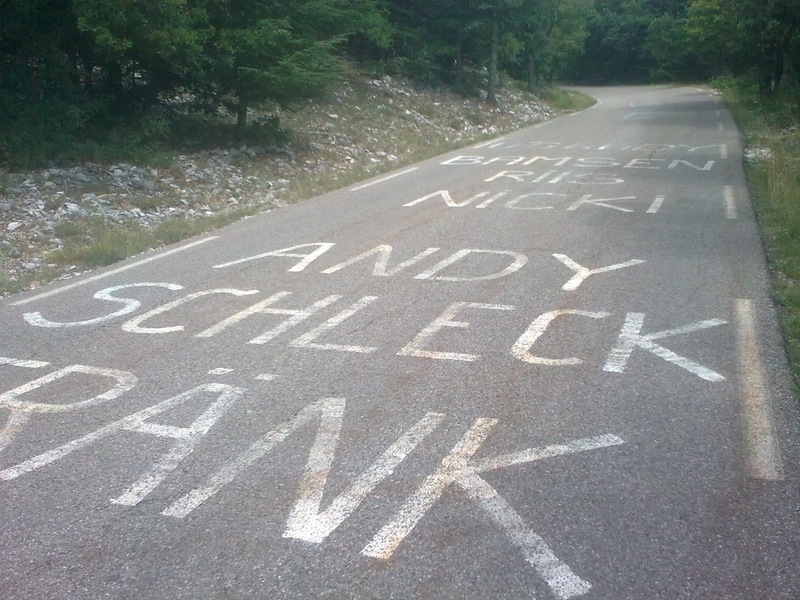 I want to be able to take the mickey out of Andy Schleck again, and I can’t do that while I’m sympathising with his timorous downhilling. 7.) I will blog to my strengths. Next year, every post will contain a reference to Peta Todd, deer and Mt Ventoux, because those are the ones that get the traffic, and I believe in serving my audience, which apparently consists of horny, animal-loving grimpeurs.